Welcome to the McGaheysville Volunteer Fire Company Guestbook. Your feedback is important to us. Feel free to leave your comments. Just wanted to thank you for a wonderful weekend. We spent Friday evening and most of Saturday at your annual lawn party. The food was terrific, people friendly and we had a great time. Even won a little cash playing bingo. We will be there next year, God willing. Thanks again for providing us with a fun weekend. We will spread the word to all our friends for next year. Saying hello from the Selinsgrove 80 house to a fellow 80 house. I was recently in Shenandoah on vacation and was unable to find out that the 80 truck I saw online at one of Shenandoah's fires was you guys until it was time to head back home. I talked to a FF/EMT named Dustin who works EMS also he was a great guy. Next year when I come to the area for vacation I will stop by. Stayed @ Massanutten Mountain Resort this past week and hoping to stop in before we head back home. Just wanted to take some time and recognize your department. Whether in big cities or small towns, the core of firefighting and the brotherhood of its members remain the same. We've seen some significant weather in our short time here and as I see y'all at your duties I think of what's happening back home. My prayers go out to each one of you, that God keeps y'all safe. Hopefully in a few years to come, I will have the great pleasure in calling this beautiful place home. Stay safe, God Bless my brothers! I even went on a few calls with granddad when we were there visting. I have not been back since granddad passed away, but hope to be out there the in the next couple years to visit with my aunt Jackie Life, and if possible would like to stop in and look at all the changes that I am sure have taken place since my last visit. I enjoy going to your website everyonce in awhile to see what is happening and to look at some of your history pictures and see some family memories stored in your photos. Keep up the good work of protecting your community. My brother recently visited McGaheysville fire station and town. He could not say enough good things about the hospitality he received. We are looking to purchase your Fire station's t-shirt for our family. Please advise if they are available to purchase via the web page. 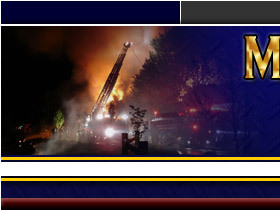 Nice website for good publicity, but would be even better if you included information on burn ban and burn permits. Possibly safety on backyard burning, although I can see where that might encourage the practice. Thanks to all of you professionals and volunteers. This is a nice website with alot of information. We vacation on the mountain couple times a year and have meet some members. They are always great to speak with and were nice to give tour of the "house". Is there a spot on site to purchase shirts, etc from your company, missed it if there is. It was an honor to be a part of the memorial service on June 6th. We are very sorry for your loss. Give our best condolences to the family. Be safe and may God bless. I have the utmost respect for what you all do...you are the true heroes..doing what you ..when you do it, regardless of the consequences..GOD bless you all. I AM SORRY FOR YOUR LOSS LAMB FAMILY MY THOUGHTS AND PRAYERS WILL BE WITH YOU. I would like to thank all you firefighters for all you do. Thank you for the support during the tough times and thank you for all the verious things you do. Oh and remember God recieved a new firefighter for heaven. When I turn 16 you will recieve a new volunteer FF. We would like to thank you for letting us be a part of your Christmas party again this year. We know you have had a trying year and this was a well deserved night to unwind and enjoy yourselves. Thanks for all that you do for our community, we could never repay you enough for that. I'd like to personally thank everyone of you! Your crew literally saved my life back in 2004 and now you helped my boyfriend in the crash on 33 on Nov 30th. THANK YOU for everything you do in our community! My love, prayers and gratitude are with you everyday. I was down on thanksgiving weekend of 2008, I stopped in and was amazed on your fire house.I got a appl.and hoping to move down to that area in spring of 2009..hope to get invovled with your company.. I would like to send my dearest condolences out to each member and to the family of the young FF that was lost. I have seen too much over the 21 years I have been doing this, most recently the 9 FF that were lost here last year. I too have had the unfortunate happening of loosing a close friend and fellow FF in 1992, that pershished all most the same way on a Vol. F.D. in Florida. My prayers go out to all!!! On behalf of the officers and members of the Aston-Beechwood Vol. Fire Company, I would like to express our deepest condolences and our most heart felt sympathies in your time of loss. It was not long ago when we were tragically struck by the loss of our Chief. I pray that the members of your company can find comfort knowing that your brothers and sisters in Delaware County (PA) are grieving with you. Our hearts go out to you and our prayers are with Roy's family and the entire McGaheysville Volunteer Fire Company. We, too, lost our eighteen year old son three years ago and no one can ever really know the pain and sorrow felt by family and loved ones. And the sense of loss felt by Roy's fellow firefighters is just as strong, but know that faith and the recollection of all the good memories will help you through this time of intense grief. If there is anything we can do, or if you just need someone to talk with, please contact us through the Leesburg Volunteer Fire Company. I have been a volunteer firefighter since I was 16. I am now Chief of the Nolichuckey Volunteer Fire Dept. We have been blessed with safety and never losing any of our members. I can not imagine the pain and hurt that you all must be feeling for your lose. We have teenage members too, that are very dedicated to the dept. and their jobs. Our thoughts and prayers are with you all at this time. May God bless and keep each of you. I saw a link on the internet to your Myspace page and it said your dream was to become a fireman for the FDNY. Your in heaven now with 343 of them and ones that past before and after them. You'll be in good company with them, because God only takes the best. Save us a spot on the rig brother and keep us all safe down here until then. My prayers also go out to the family and friends of Roy during these tough times. Our thoughts and prayers are with you all. May our fallen brother never be forgotten, and may he watch over us all until we join him in heaven.